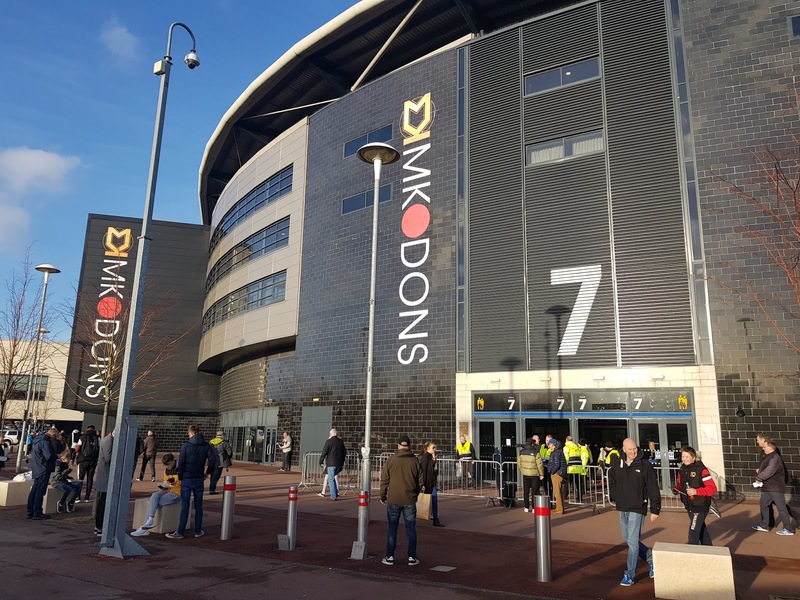 Stadium MK is situated in a retail park in the Bletchley, a constituent town of Milton Keynes, around three miles south of the city centre. Bletchley railway station is the nearest one to the ground as it is 1.5 miles south of the stadium. During my first visit to the ground I alighted at Milton Keynes Central station but the transport staff were unaware that Milton Keynes even had a football club so best to avoid this station if possible. 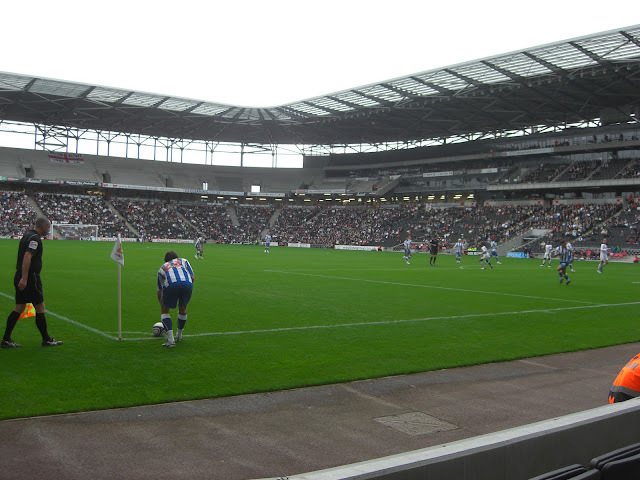 The venue has been home to Milton Keynes since 2007 when they left their temporary home at the National Hockey Stadium. The ground has a large lower tier which extends the whole way round the arena. This lower tier has a capacity of 22,000 and was the only one that had been completed upon my first visit. At the back of the lower tier there are spacious concourses for fans to congregate pre-match and at half-time. In 2014 the club brought the second tier into use increasing the venue's capacity to 30,500. This top tier is not quite as uniform as the lower tier with sections carved out for separated seating as well as large screen TVs in all four corners. The seating goes round the eastern, northern and southern sides but ends at the north-west and south-west quadrants. The western side of the ground has the hospitality boxes and there is a central seating section in front of these which only takes up around a quarter of the upper tier. There are also additional smaller seating sections towards the two quadrants on this side. All seating in the ground is padded in a similar fashion to the Emirates Stadium and there is ample room for all spectators, certainly one of the best in the Football League in this respect. All along the top of the upper tier is the stadium's hotel. The Doubletree by Hilton has over 300 guest rooms some of which have pitchside views. Inside the stadium there are conference rooms as well as several restaurants and bars. The club reception and hotel reception are both on the western side of the ground and this area also includes access to the Red Dot Bar with a large club shop in the south-west corner. The opposite side of the venue has a back entrance to the hotel as well as two separate ticket booths (one for home fans in the south-east corner and one for away fans in the north-east corner). Another addition in the years since the stadium opened is Arena MK which borders the southern end of the venue. This large indoor space was unveiled in 2014 and can accommodate 5,000 people for events including exhibitions, concerts as well as hosting darts and badminton championships. Despite the large number of changes in the years since it was built there is more scope to develop the site if required. The gap between the upper deck and the high roof alludes to the fact more seating can be added with a potential maximum of 45,000 seats once complete. If the club were ever promoted to the Premier League they certainly have a stadium which could be one of the top 10 in the country for capacity and facilities. 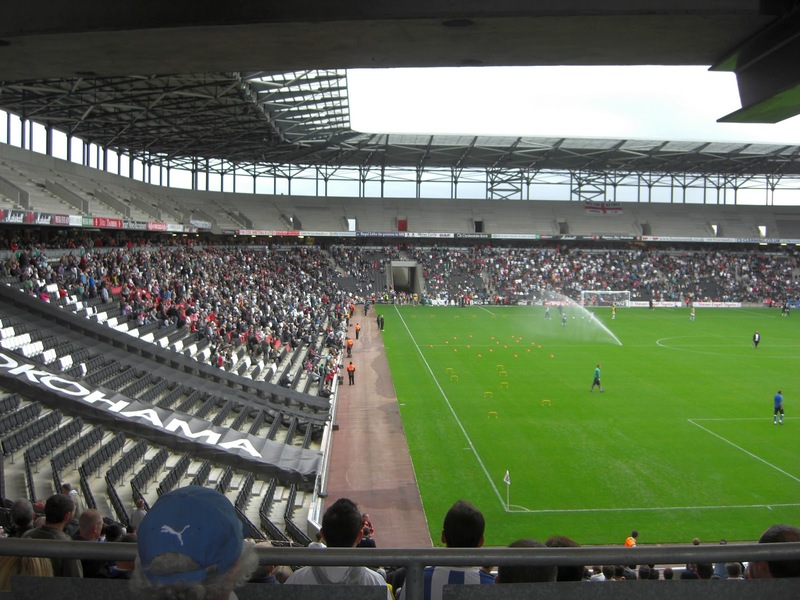 My first visit to Stadium MK came on 2nd October 2010 when I saw Milton Keynes Dons vs. Colchester United in a Football League One match. The visitors dominated the first half and took the lead through Marcus Okuonghae in the 26th minute. Colchester failed to kill the game off though and the hosts performed much better after the interval. This told in the 66th minute when Angelo Balanta's excellent curling shot from just outside of the area found the back of the net. The rest of the game was fairly even with the match finishing 1-1.